19 Photos E.P. & L.P.
Ah, three-day weekend. Doesn’t get better. It’s E.P. 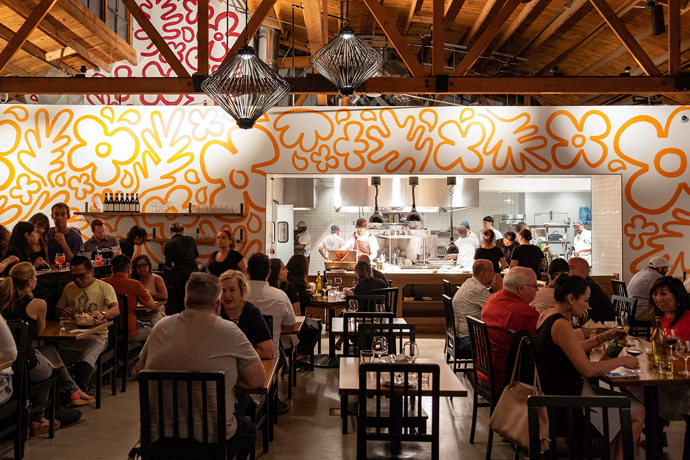 & L.P., a glorious three-level pile of Southeast Asian feasting and rooftopping—it opens tomorrow in West Hollywood and, well, this slideshow makes it feel pretty important. You’ll enter off La Cienega into a lobby wrapped in LED greetings and offbeat wallpaper. Hey, stop. Look. Offbeat wallpaper. Wow. Above that is L.P. A peerless rooftop spilling over with native plants and ludicrous Hills views. It will be mellower up there, and open until 2am. That is where to kick back between the sky and a fire pit for spiced Wagyu jerky, soft-shell crab bao and Fijian nachos. Boba might not usually be your thing—but it is spiked here, so you know. Oh. And on the other side is Frankie’s. A small, rentable private bar named for Frankie Knuckles.